Who says popcorn has to be a junk food indulgence? These healthy recipes show you how to enjoy it guilt-free! Popcorn has been a pantry staple of dieters for decades. But there’s a lot more delicious things to do with popcorn than stick it in the microwave and, a few minutes later, eat it straight out of the greasy paper bag. There’s always the option of raiding the spice cabinet for extra flavor, but these 7 recipes take popcorn a step past that simple sprinkle and use fresh herbs, protein powder, nuts and fruit, and more to make unique, delicious popcorn-based treats. 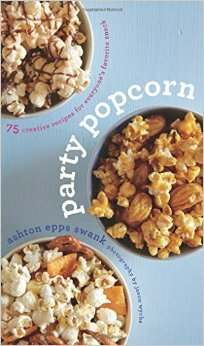 Party Popcorn: 75 Creative Recipes for Everyone’s Favorite Snack will be useful year-round, whether you need popcorn for movie night, game day, or an afternoon snack. This combination is simple but classy: olive oil, torn basil, and garlic salt. And once you get a taste for fresh herbs mixed in with popcorn, you’ll want to experiment with others like mint, tarragon, and sage. 1. Pour the popcorn into a large bowl, and remove any unpopped kernels. 2. Add the fresh basil to the bowl. 3. Drizzle olive oil over the popcorn. 4. Sprinkle with the garlic salt, and gently toss to coat. 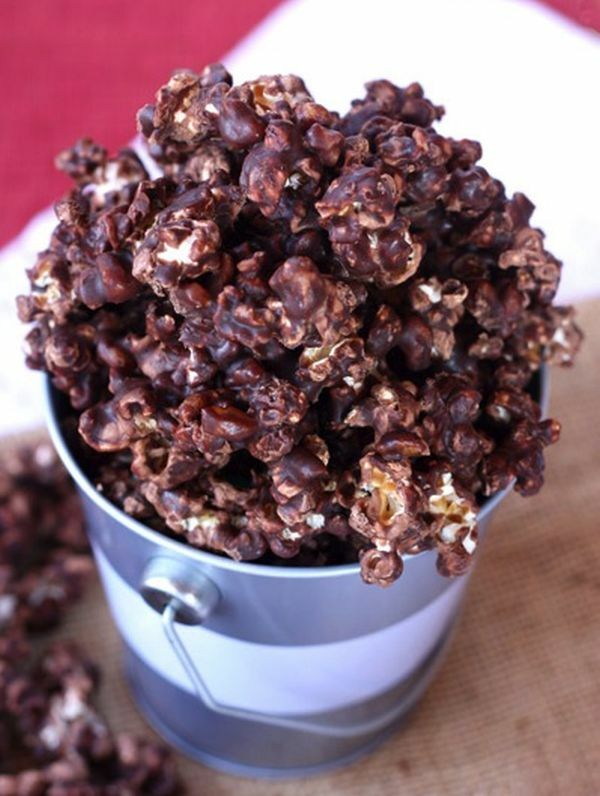 Popcorn drizzled with chocolate seems way too decadent for a healthy snack. But when popcorn is made with coconut oil, cocoa powder, and just a little honey, the final result has nothing but wholesome ingredients. And if all that isn’t enough to satisfy your chocolate craving, you can still finish it off with a touch of melted chocolate. You can also spice it up by adding a dash of cinnamon or ground ginger. 1. Place the kernels in a large microwave-safe bowl, and cover the top almost all the way with a plate. Some of the steam should be allowed to escape. 2. Pop for about 2 minutes. 3. Melt the cocoa powder, honey, dark chocolate, and coconut oil in a bowl. 4. Pour the chocolate mixture over the popcorn, and toss to coat. Set in the fridge to harden. The original recipe calls for flax seed, but here it’s swapped out for a scoop of protein powder instead. Peanut butter – or PB2, which reduces the fat – also adds a bit of protein to this healthy snack bar, plus chunks of naturally low-fat almonds. 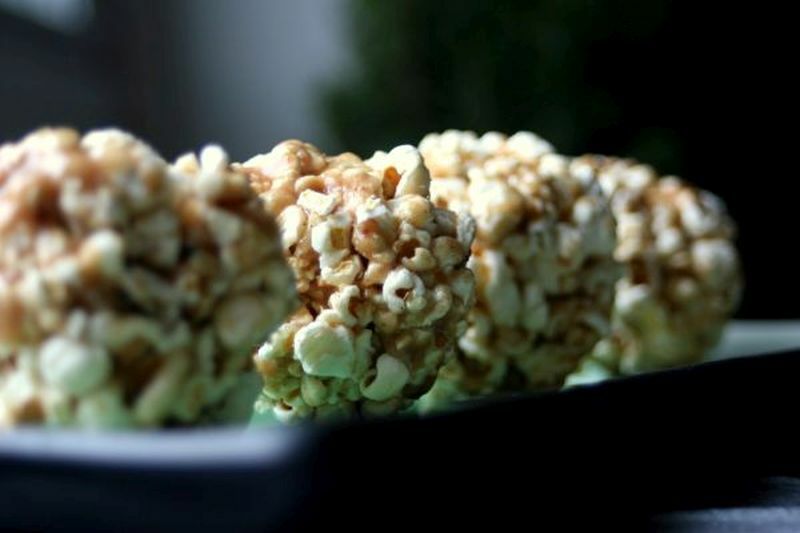 Like any good portable nutrition, these popcorn bars are versatile too. You’ll love using them to refuel on the trail, or grabbing one as the perfect ready-made snack to keep in your gym bag. 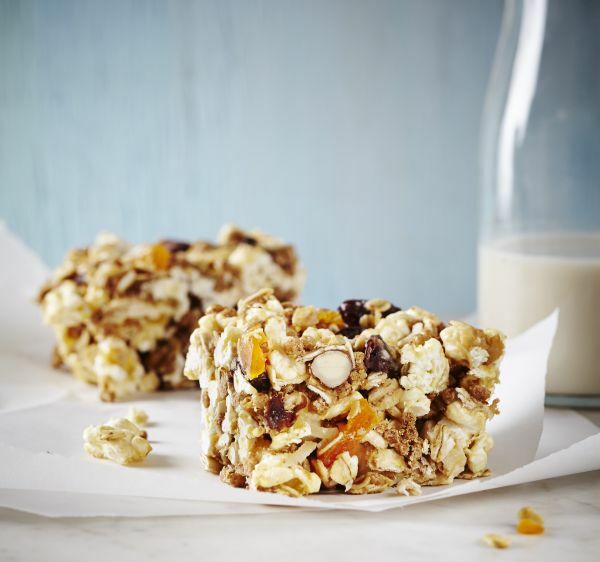 These bars also look awesome on a party platter – like a way healthier version of Rice Krispies squares. 1. Preheat the oven to 350°F. Lightly spray a rectangular baking pan (9” x 13”) with cooking oil. 2. In a large bowl, combine the popcorn, bran cereal, oats, raisins, coconut, protein powder, almonds, and dried fruit. Stir well. 5. Transfer mixture to the greased baking pan. Use slightly wet hands to firmly press the mixture into the baking pan (or cover with parchment paper to keep your fingers from getting sticky). 6. Refrigerate for at least 2 hours before cutting into 20 equal-sized bars. There’s no reason popcorn balls have to just be made for Halloween! They’re actually a clever way to make an alternative to portable protein bars. Mix popcorn with peanut butter, protein powder, and cereal. It’ll take less time and money than picking up packaged snacks. Plus, popcorn is way more palatable than the typical dense, bland protein bars. 1. Prepare a cookie sheet with a layer of foil, or spray with cooking oil. Set aside. 2. In a large mixing bowl, combine the protein powder and water. Add the popcorn, and slowly mix until popcorn is evenly coated with the protein glaze. 3. To soften the peanut butter, warm it in the microwave for about 10 seconds. 4. Gently fold the peanut butter and the Cherrios into the popcorn mixture. The popcorn will not stay completely puffed, so mix slowly and surely to keep it as fluffy as possible. 5. Spoon the mixture onto the cookie sheet, and form into balls. Place in the fridge to set, and enjoy once hardened. This popcorn looks similar to the stuff in movie theaters but isn’t laden with trans fats. Here, the color actually comes from red palm oil – the plant-based oil richest in vitamins A and E. And the red hue actually indicates a lot of carotenes. Stumped on where to get it? 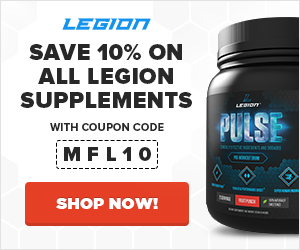 Look at your local health food store, or just go the easy route and order on Amazon. 1. In a pot over medium-high heat, stir together coconut oil and popcorn kernels. As it heats, stir together the salt and hempseed in a small bowl. Set aside. 2. Cover the pot with a lid, and let the popcorn continue cooking until you hear less popping per second. 3. Once you hear less than a pop per every second or two, remove it from the pot. Transfer to a bowl. 4. 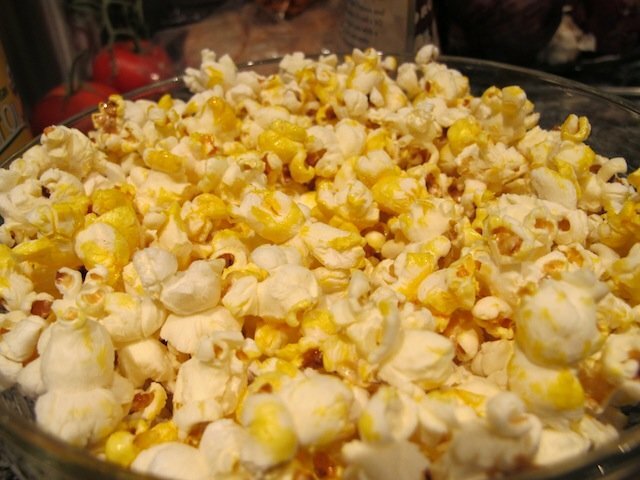 Top the popcorn with melted red palm oil, and toss well with the hempseed-salt mixture. Technically this recipe doesn’t contain any corn; it’s like little bits of roasted cauliflower with excellent seasonings. 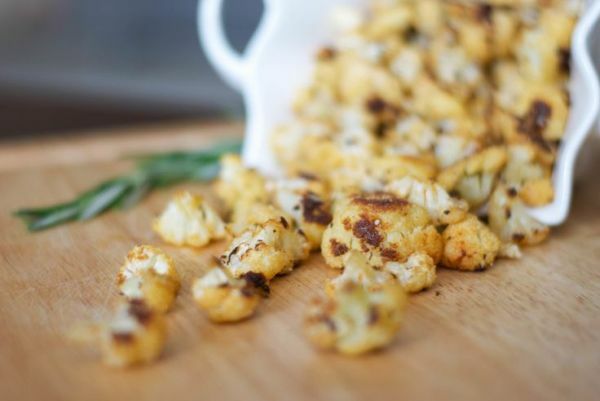 But it’s such a good stand-in for popcorn you’ll be just as happy with this cauliflower version in your snack bowl. You’ll have to be patient to dry out the cauliflower until it’s a little crispy in the oven, but it’s worth the half-hour wait to inhale it along with rosemary, paprika, and Pecorino Romano cheese. 2. Cut the cauliflower into little bite-sized pieces. Remove the stems and stalks with a sharp knife. Rinse under cold water, and add cauliflower to a bowl. Set aside. 3. In a small bowl, combine the oil, salt, paprika, and rosemary. Add to the cauliflower, and mix well. 4. Evenly spread the cauliflower onto a baking sheet. Bake for 15 minutes, and flip the pieces. Continue baking for 15 more minutes, until golden brown. 5. Remove from the oven, and sprinkle cheese over the top of the hot cauliflower “popcorn.” Toss to coat. This recipe seems so simple and delicious that you’ll kick yourself for not thinking of this awesome combo first. I don’t have to tell you how well apples and peanut butter go together, and you’ll get a whole other kind of crunch with a layer of popcorn pressed on top. This is a classic after-school snack upgraded, and what else could complete a taste of childhood like a sprinkle of cinnamon-sugar on top? 1. Pop the microwaveable popcorn according to package instructions, or prepare on the stove. 2. Slice the apple into round about 1/4” thick. Remove the centers. 3. Place a spoonful of peanut butter on each apple slice, and spread until even. Use just enough to thinly cover the apple. 4. Place a small handful of popcorn on each apple slightly, gently pressing the pieces into the peanut butter to help it stick. 5. In a small bowl, mix together the cinnamon and sugar. 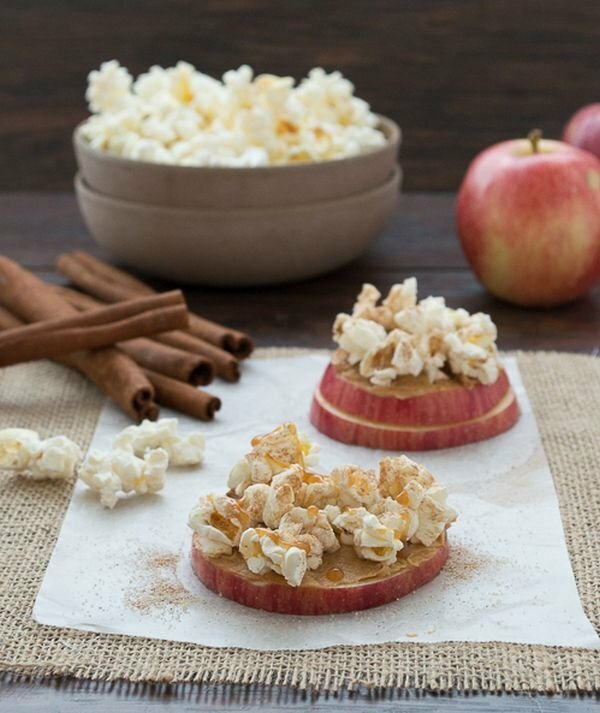 Sprinkle over the top of the popcorn apple bites, and enjoy! 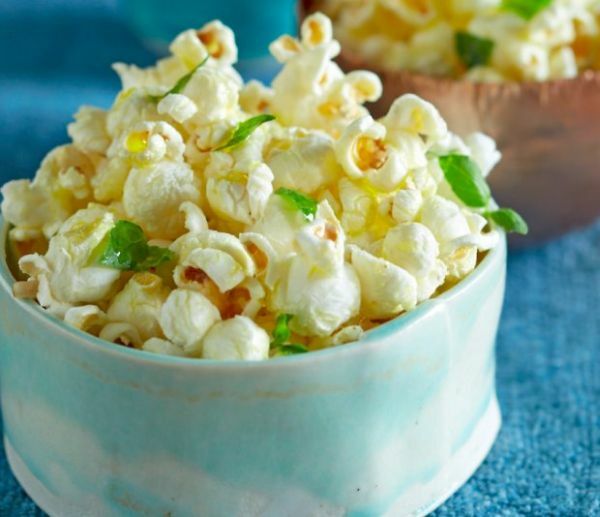 What did you think of these healthy popcorn recipes? Have anything else to share? Let me know in the comments below!